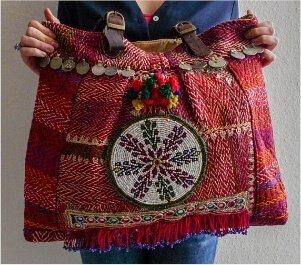 Unique boho bag made of various embroidered ethnology fabrics with shiny pearl tassels, yellow lining and zipper. Spacious vintage weekend bag with genuine leather handles. This individual carrier bag combines hippie chic with an oriental touch and is the perfect companion for a long weekend or a job trip. This unique piece was handmade by a group of young designers who produce Indian-inspired bags and pouches in boho style. Please understand that the fabric used to make this bag is antique. Therefore, small defects, stains and wear are normal and are not considered defects.